Lambeth Cyclists: Can we create Space for Cycling in Loughborough Junction and Myatt's Fields? Can we create Space for Cycling in Loughborough Junction and Myatt's Fields? 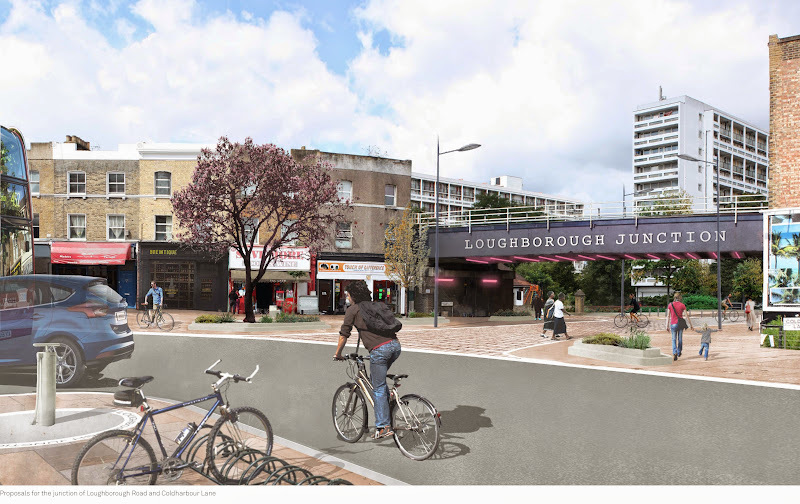 Lambeth Council have outlined plans for improvements to Loughborough Junction and Myatt's Fields in SW9 and SE5 which will make the area safer for cyclists and more people friendly. The area currently suffers from heavy through traffic making the local residential streets dangerous for pedestrians and cyclists. This especially affects families using Myatt's Fields Park and school students walking to local primary schools and St Gabriel's College secondary school. Lambeth propose closing Loughborough Road (see photo), Barrington Road, Gordon Grove, Lilford Road, Calais Street and Padfield Road to cars. A new public space on Loughborough Road around Wyck Gardens will also be established for community use. In addition a new quietway for cyclists between Ruskin Park and Myatt;s Fields Park will be created which will make travelling between these two parks easy for cyclists and pedestrians of all ages, The new arrangements should reduce parked cars on the roads and will make any future controlled parking zone (if local residents agree) possible as the roads will have less traffic rat running through the area. Local residents and businesses will still be able to fully access their homes, premises and streets but may need to take a slightly different route. The reduction of through traffic should mean that journey times will be little changed. The full proposals for Loughborough Junction and Myatt's Fields can be see on the Lambeth website at www.lambeth.gov.uk/lj. The deadline for submission of consultation responses is 22 October 2014. Lambeth Cyclists fully support these proposals as we believe that they will make the area far more people friendly. This is a real opportunity to make Space for Cycling in Lambeth.